Ford’s new compact crossover will debut on April 2. It’s no secret that Ford is planning an SUV onslaught, with the launch of the new Explorer, the reborn Bronco, and the new Lincoln Aviator. 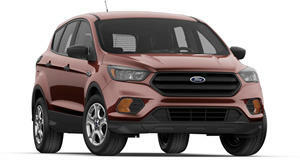 Last year, Ford North American product communications chief Mike Levin confirmed several new models launching in 2019, which will also include the new next-generation Escape. Now, Ford has released a teaser video on social media giving us a first look at the next-generation compact crossover before its world debut next week on April 2. From what we can see in the video, the new Escape will share some design cues with the new Ford Focus, which has been discontinued from the US. The taillights and tailgate look identical to the new Focus, but this isn’t surprising since both models share the same platform. We also get a close-up of the grille, but we'll have to wait until next week's debut to see the new Escape in full. Ford hasn't released any technical details for the 2020 Escape yet, but leaked VIN documents suggest the base Escape S will get Ford's 1.3-liter Dragon three-cylinder that will replace the 1.5-liter EcoBoost cylinder. In the current Escape S, this unit produces 179 hp and 177 lb of torque. The range-topping model will reportedly use the same 2.0-liter EcoBoost four-cylinder powering the Lincoln Corsair. Hybrid and plug-in hybrid versions of the new Escape are also expected to be introduced to the lineup with a 2.5-liter four-cylinder engine. More details will be revealed when the new next-generation Ford Escape debuts next week.